Hakama is probably best known as traditional piece of samurai clothing and as a part of keikogi or training uniform worn in Japanese martial arts such as Kendo, Iaido, Kyudo, and Aikido. Samurai had to wear a long hakama when visiting Shogun castle. This holds back the ability to walk or doing fast shikko (the knee-walking that we practice in Aikido). This helped preventing a surprise attack or assassination attempt. 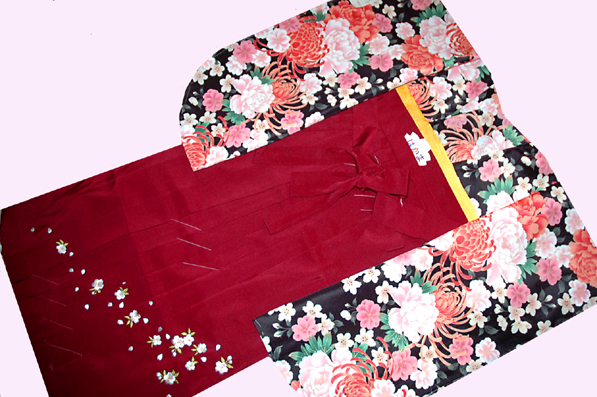 The history of hakama dates back to the third century. Some clay figures excavated from early Japanese gravesites (250AD – 538 AD), are wearing hakama. “Hakama” used to mean any type of baggy pair of pants and skirt-like bottom wear in Japanese. The word appears in the Japanese creation myths described in Kojiki, the oldest surviving book in Japan (712 AD). Hakama designers fused European fashion with hakama and made "Karusan Hakama." The name came from calcao (Portuguese) or calzon (Spanish). The type of hakama used in Aikido appears much later in the 12th century when theBushi (warriors) started to rule the country. The hakama originally worn bybushi/samurai was divided like trousers, tied at the waist and fell approximately to the ankles. This kind has been called “umanori (horse-riding) hakama.” Women stopped wearing hakama sometime in the 14th century, and hakama became men’s wear. During the Edo period (1603–1868; a Hollywood movie, The Last Samurai, takes place end of this era), the horse-riding hakama became the standard daily wear of samurai class as well as a part of the formal complete outfit called “kamishimo” ensemble. Samurai visiting the shogun at court were often required to wear a very long hakama. Normally, these hakama had remarkable (or ridiculous…) length in both the back and front, forming a train 1 – 2 feet long and inhibiting the ability to walk or to perform quick shikko (the knee-walking that we practice in Aikido). This helped prevent a surprise attack or assassination attempt. Many different styles of hakama were designed after the mid-16th century. 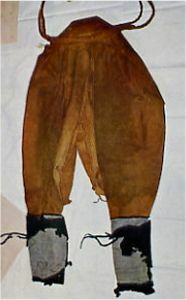 Some craftsmen even fused European fashion with hakama and made “Karusan Hakama.” The name came from calcao (Portuguese)/calzon(Spanish), and the hakama was an imitation of the ballooning knee length pants worn by the traders from Europe. Hakama for Kendo was also designed during this period. 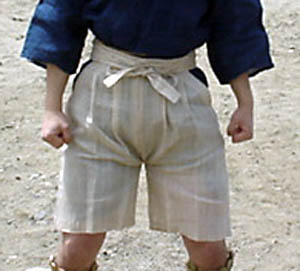 It is said that it was the first hakama specifically made for a martial arts uniform. Short hakama for hunting, traveling and working outside during the summer. In the Meiji period (1868-1912), after the samurai class was abolished, women started to wear hakama again. The Meiji reforms of the social and political systems made education became open to Japanese women. 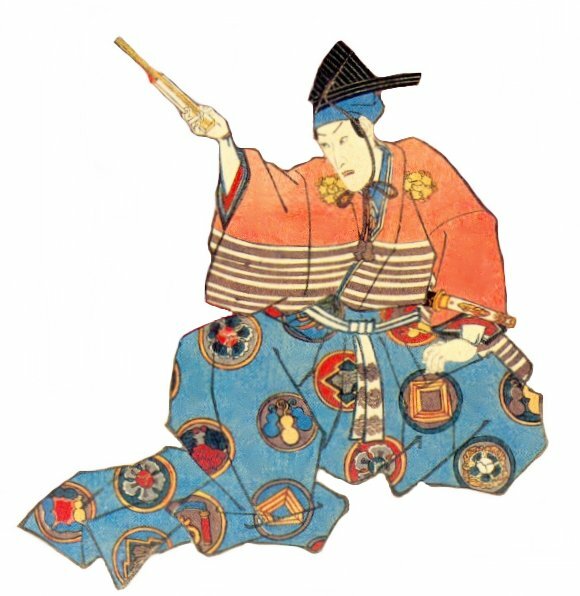 Although hakama was still considered to be men’s wear, the ministry of education permitted female college students to wear hakama because a woman’s kimono would not be a comfortable outfit for school activities. Maroon- or purple-coloured hakama was the typical school uniform. Soon, these hakamas came to be a symbol of women’s rights and were a trendy fashion statement among the cultured modern Japanese women. A woman's hakama for college graduation. Nowadays, the majority of Japanese men wear hakama only on formal and traditional occasions like New Year’s Day celebrations, tea ceremonies, weddings and funerals. Also, you would see women in hakama and colorful kimono at college graduation ceremonies. At places like Shinto shrines female attendants usually wear red hakama and white tops. 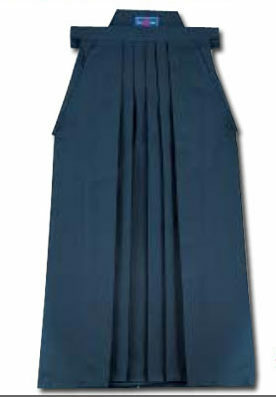 The hakama has five pleats on the front and is divided into two parts on the back. It is said that the seven pleats in the martial arts hakama represent the seven virtues of Bushido (the way of the samurai). Particularly the five pleats in the front are considered essential qualities and prompt a person to reflect on the nature of true Bushido or the spirit of Japanese martial arts. In The Book of Five Rings (Go Rin No Sho), an old text on Kenjutsu and the martial arts, a famous sword man, Musashi Miyamoto, emphasizes these five virtues, which originally come from Confucian philosophy. Why don’t students usually wear hakama until shodan ? I believe many aikidoka have heard the story that O-Sensei used to insist all his students wear hakama when training. You might wonder then why students even at the Hombu Dojo in Japan do not wear hakama until shodan (women until 3rd Kyu). The late Morihiro Saito Sensei (1928-2002), who was a live-in student of O-Sensei during the post war period, recalled that students would take old futon or comforter covers and have them made into hakama, then dye them black. Over time the dye would fade and the dojo looked colorful because of the patterns and colors of the old futon covers. It was during and after WWII that material for hakama became scarcer. After the war, some made hakama out of air raid curtains but because the sun had stressed the fabric, the knees would practically turn to dust when the student performed suwari waza. So it was at this time, when Japan was poverty stricken from war and everything was so expensive, that it was decided that students didn’t have to have a hakama to practice until they attained shodan. In Aikido Shugyo Dojo, students start wearing hakama when they receive a rank of first kyu while in many dojos, only the black belts wear them. In some others, everyone, regardless of their rank, is required to be in hakama on the mat. By the way, when you say “The name came from calcao (Portuguese)”. The correct spelling is “calção”. The guidelines for wearing hakama in the dojo depend on the sensei. You need to have a conversation with him/her about it. In North America, I have only seen black hakamas used in Aikido practice.